Westward Ho! is famous for many things including its two mile stretch of golden sand and the unique Pebble Ridge. Without this massive bank of cobbles the sea would erode the sand-dunes and coastal grassland located between Westward Ho! and Appledore. 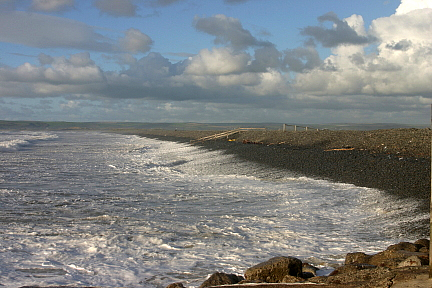 The Northam Burrows Country Park, at the mouth of the Taw Torridge Estuary, is a designated site of scientific interest and forms part of the United Nations Biosphere Reserve. 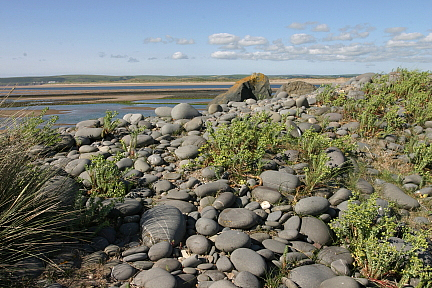 From the tip of the Pebble Ridge where the estuary meets the Atlantic Ocean you can just see the notorious Bideford Bar, Saunton Sands and Braunton Burrows. 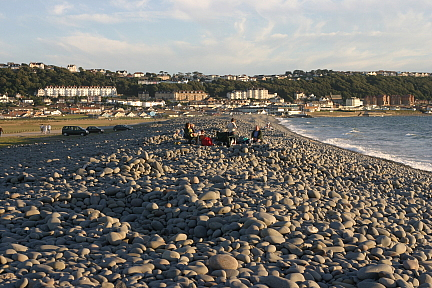 This natural phenomenon has been holding back the tide for years and is formed when debris from rock falls further up the North Devon Coast is washed ashore at Westward Ho! Boulders, cobbles and pebbles are pounded by the awesome power of the waves and flung back on the beach. An alternative access to the Burrows is through Pimpley Gate, along Golf Links Road just passed the entrance to the Royal North Devon Golf Club. You can drive or walk down to Sandymere Car Park behind the pebbles. The sand-dunes start at Sandymere which is also where the Visitors Centre is located. It is well worth calling in here for advice if you are planning a walk as there is much to see for nature lovers. An area has been fenced off here to protect the Dunes and is now a haven for ground nesting birds and wildlife. There are information boards on the edge of the fenced off Dunes which inform walkers about some of the inhabitants including the Small Tortoiseshell Butterfly and the Common Lizard. Another visitor is the Kestrel which hovers ready to prey on mice and voles. I recommend picking up the handy booklet "Northam Burrows, An Illustrated Guide" which tells you all about the history, geography and geology of Northam Burrows, including its people, vegitation, butterflies and birds. There are regular guided educational walks during the summer. The Park is open to pedestrians at all times but there are restrictions on vehicles. The Visitor Centre is open from the end of May to early September and the toilet facilities from Easter to the end of October. Don't miss the annual Westward Ho! "Potwalloping Festival" on Whitsun Bank Holiday Weekend from 23rd-25th May.